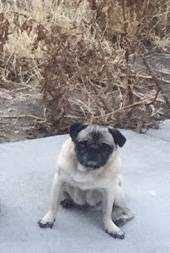 My fawn female pug went missing in East Kennewick near 8th and Elm street which is red apple, Burger King area. She is 9 years old and probably has more grey on her face than in the pictures I’ve posted since she’s been missing a while now. Peaches has been missing for a little over a year and a half or so, but I’m not going to stop searching for her. I’ve been praying she’s somewhere safe, I hope if someone does have her they will see this and reach out to me.